The CEDRIC Centre’s specialized program helps people of all ages to lose or gain weight and to maintain a natural weight for their bodies, for life without diet and rigorous exercise regimes. We teach you how to establish a healthy relationship with food, yourself and others, how to deal with stress, anxiety and depression in ways that boost self-esteem and allow you to feel more secure as you focus less on what you eat and weigh. 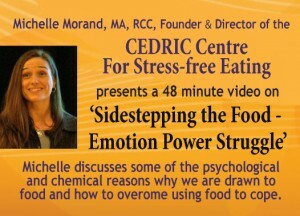 See intro video for the CEDRIC Centre Mindful Eating Info Package. The CEDRIC team provides counselling in person in British Columbia, Canada, as well via skype and phone worldwide. 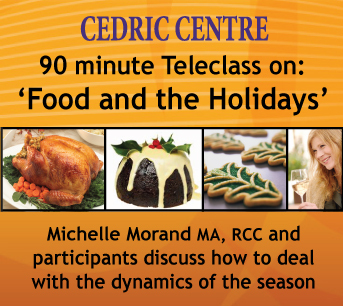 We offer 3-day Workshops, Hard Copy and Downloadable Resources sold separately or accessed through our Online Program and incude: CD’s; DVD’s; Workbooks; Teleclasses, Lessons, Assignments, a book entiled, ‘Food Is Not The Problem – Deal With What Is’ by CEDRIC Founder and Director Michelle Morand, MA, RCC and more! 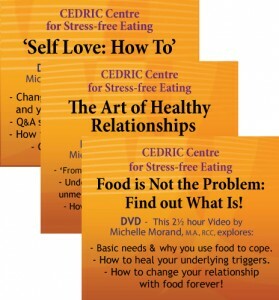 CEDRIC clients learn everything they need to know about why they struggle with food, what is really triggering the frustrating way they think and behave, and what they can do to achieve lasting change when it comes to food, their approach to relationships, self-esteem, and other areas of their life. 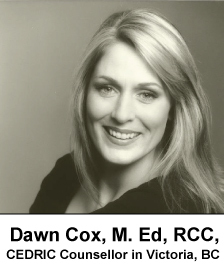 Examining the core reasons why we use any less than healthy coping strategies and learning how to deal with stress in a way that is healthy and empowering, not only solves the longstanding issue people have with food, but also addresses the underlying triggers to create true comfort and peace with all aspects of life. All 3-day Workshops cost $636.00 + tax and payment plans are available. These 3 different 21 hour events are very effective in providing the education and tools to achieve a healthy relationship with food and body image, and help heal many other issues in the process. Participants learn how to deal with stressors in their life in ways that empower them to lose their rigid, ‘all or nothing’ thinking, uncover the underlying reason why they do what they do with food, address self-esteem issues, set boundaries/ask for what they need, develop healthy, mutually beneficial relationships and so much more. They each cost $636.00 plus tax, and we offer payments plans. Treat your yourself to an experience that will benefit you for the rest of your life as you learn the tools and knowledge to heal the core issues in your life allowing the balance and calm to grow and a whole new way to address life to blossom! Please see the videos and read the written feedback on the workshops to find out how glad people are that they joined us. 2 live 1-hour teleclasses each month with Michelle and any member who wishes to join in for a call that is recorded and archived for any member to hear at their leisure. 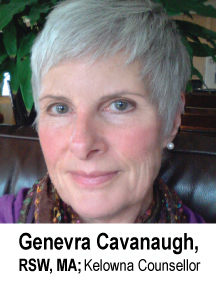 Emailed Daily Centering Exercises – short quotes and messages sent to keep you focused. 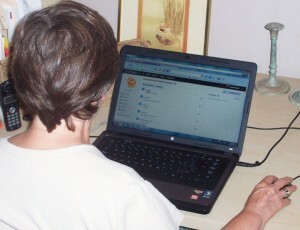 Exclusive forums where members share comments, insight, support and pose questions. 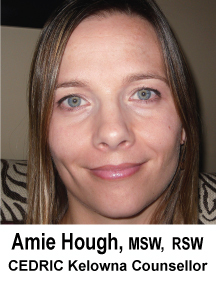 Key hand-outs, breathing exercises, lots of lessons and assignments and more. All Resources are available both as hard copies* and downloads and are sold individually or as bundles. 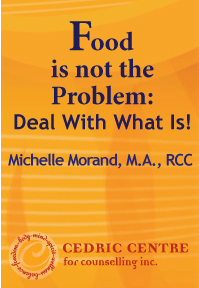 Michelle’s book ‘Food Is Not The Problem – Deal With What Is’ has helped thousands, as readers uncover the many different dynamics involved with a stressful relationship with food and other less than healthy coping strategies. They learn knowledge and tools to bring about a sense of balance, calm and freedom from using food to cope! 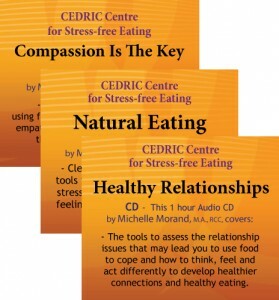 CEDRIC Centre Workbooks are really helpful tools on your road to recovery. Choose from: ‘Core Beleifs’, ‘Natural Eating‘ or the ’30 Day Core Tools’ Workbook (** price for online members reduced for core tools WB; the other 2 wb’s: free with program). 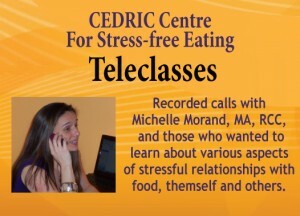 Michelle Morand also shares many important lessons in her CD and DVD series: Our Teleclasses are such a great feature of our Online Program that we held 3 special calls for non-members, recorded them, and made them available as downloads for anyone to hear. Our Free Newsletter includes information and tools to help with recovery. You can also access dozens of archived articles that deal with Relationships, Self-esteem, All or Nothing Thinking, Natural Eating, The Logic of Binging, Basic Needs, The Diet Mentality and more. We also offer free Podcasts, Videos, Blog and great inspiration on our Twitter and Facebook With all of these support options and resources you can trust that you will no longer use food or any other less-than-life-enhancing substance or behaviour to cope with life’s stresses and challenges. As always, our team is here to help you one way or another. Just let us know how we can! For general inquiries: contact our Administrator Janice at info@cedriccentre.com or call our Victoria office at 250.383.0797 or toll free at 866.383.0797. Mail to: 5488 Eureka Road, Halfmoon Bay, BC, V0N 1Y1. 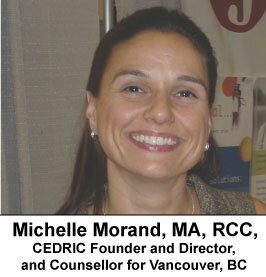 If you would like a free 15 minute assessment with Michelle, email mmorand@cedriccentre.com or call 778.990.4606 or just ask Janice to set it up. 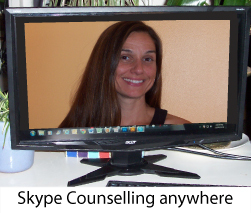 Remember, if you can’t come to us, for in person counselling, in Vancouver, Victoria, Sechelt or Kelowna we’ll come to you through skype or phone counselling sessions worldwide. ‘Master Your Brain – Master Your Behaviour – Date: July 5th to 7th ‘Mastering Balance: Creating Solid Self-Esteem and True Inner Peace’– Date: July 12th to 14th Venue: MacEwan Conference Centre, U of Calgary, 2500 University Dr NW Calgary, T2N 1N4 There is a hotel at the University, if you would like to stay there as well.